Now 30% OFF in the Crochet Spot Store, this pattern contains 3 sizes: toddler, child, and adult. 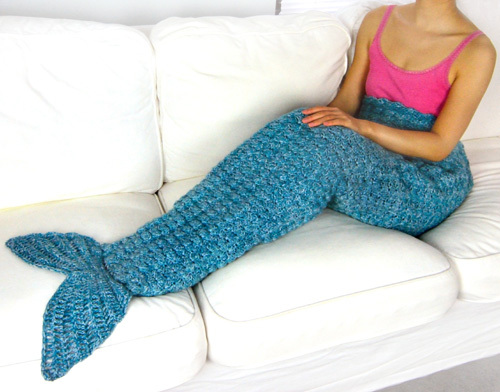 Crochet a cute, mermaid tail blanket for anyone in the family. You can even crochet mother and daughter matching blankets. If you’re looking for an in-between size, this pattern is also easily adjusted to make it any size you desire. No sewing is required for this pattern. The blanket is crocheted in the round from the bottom up using an easy shell stitch pattern. The tail is crocheted with varying stitches of different heights to create the unique, curved shape. Pattern is already marked down. There is no need for coupon codes. Log in, then add the pattern to your cart and check out. All purchases can be downloaded directly from your account once completed. Offer ends October 11, 2018. This entry was posted on Friday, October 5th, 2018 at 12:00 AM by Rachel Choi	and is filed under News. You can follow any responses to this entry through the RSS 2.0 feed. You can skip to the end and leave a response. Pinging is currently not allowed.